If you’ve lost a single tooth or a complete row of teeth, your dentist has likely asked you to consider treatment using dental implant supported replacement teeth. Dental implants are the only restoration option that allows the dentist to replace the lost roots of your missing teeth, and many patients can benefit from this innovative treatment method. 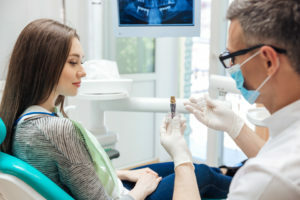 Before you schedule your dental implant consultation, you should take the time to learn a little more about what makes you a good candidate for this restoration and what questions you should ask your dentist before getting started. Are you living with jaw pain in Farmington MI? If so, you want to know how you can find relief for your aching TMJ. The team at Monet Aesthetic Dentistry has encouraging news for you: Dr. Leslie M. Metzger provides TMJ treatment. Stop the painful side effects of TMJ — like chronic headaches, facial, shoulder, and ear pain — and treat your jaw disorder before it worsens.